C# project adding dll have error. Re: C# project adding dll have error. Do you get this error when you try to compile your code, or when you launch your game in the GameLauncher or Sandbox? add exe another dll search path at runtime. I don't understand you. 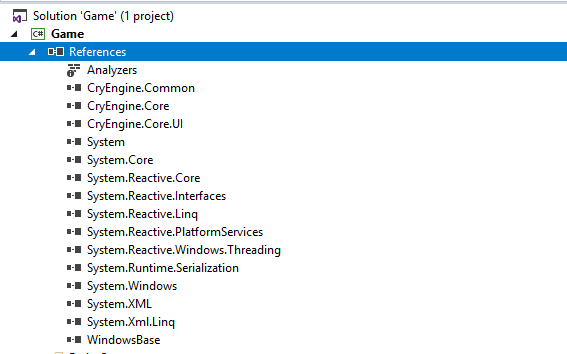 I downloaded Reactive Extension(system.reactive) through NuGet. Added this dlls with many classes and i should create "Plugin class" with path for this dll's? And sry i can't understand part of your code, may be i should read something in docs? where do you put dll? please put where is exe generated. there should be cryengine.common.dll there. I would like to raise this topic again, because the team I working in has just got into similar problem. We are using CryEngine 5.4, and working on a C# game plugin. Recently we had a need to add another C# dll as a dependency (reference) to our plugin. That dll is a 3rd party utility library, not directly related to CryEngine. The difference in errors may be related to how and when the contents of DLLs are used (whether we use a variable of some type, or simply put "using namespace" somewhere), but that's only my guess. So, we did some research, and found that when game is launched, CryEngine copies C# plugins to the temporary folder, located at C:\Users\<Username>\AppData\Local\Temp\CE_ManagedBinaries. We found, that if we manually copy the new dependencies there, then the game runs successfully, which hints that engine expects to find these dlls there, instead of the game's bin folder. My question is this: what is the correct way to add dependencies to the C# plugins when working with Cry project, and what we may be missing or doing wrong (project configuration, or else)? Almost forgot, I tried using a solution mentioned above, one with SetEnvironmentVariable("PATH"), but it did not work for me (or maybe I don't use it correctly...). Make sure the .dll file is located in the bin folder and the engine should copy it over to the temporary directory for you.